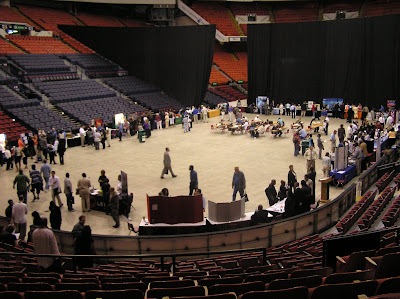 At the close of yesterday’s 2007 Pittsburgh Employment and Career Education Expo, almost 1,000 Pittsburgh area job seekers had skated around the floor of Mellon Arena speaking to 40 different companies and schools about job and career training opportunities. The companies reported they were quite pleased with the quality of many candidates that came to see them. We wish to give particular thanks to the management team from the arena (SMG) and from Aramark for the amazing job they did in helping this event run smoothly from start to finish. The real winners should be the job seekers. We have already heard of some offers being made and many more candidates moving on to the next step in the interview process. The Urban League of Greater Pittsburgh was there to let job seekers know about the services available to them and put on seminars throughout the day on topics like resume writing, interviewing skills and making a good first impression. If you missed this opportunity to be a part of the first job fair to be held at Mellon Arena, we will be back on October 3rd for our Fall event. Hottest Employer of the Week for July 16th!